On the surface there seems to be something almost blatantly sacrilegious about remaking a John Carpenter movie, even an early work like Assault on Precinct 13. Maybe it wasn't perfect, and it was certainly low-budget, but there was a distinctive raw charm to Carpenter's gangs-vs-cops flick. French director Jean-Fran�ois Richet and writer James DeMonaco took on the potentially volatile task of modernizing the original, and as much as I would have thought that it would be a pointless exercise, the final product is a tense action piece that manages to make some of problems with the believability factor seem not all that important. It's New Year's Eve in Detroit, and the titular precinct is being closed down, relocating to a new locale, which means that the only staff on duty in the practically empty building is pill-popping Sgt. Jake Roenick (Ethan Hawke), gruff vet Jasper (Brian Dennehy) and perpetually horny Iris (Drea de Matteo). There are no computers, very little in the way of weapons or supplies, and a raging snowstorm that has essentially isolated them. 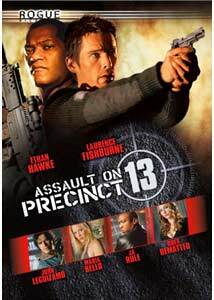 That same snowstorm forces a prison bus that is transporting criminal kingpin Marion Bishop (Laurence Bishop)—along with a handful of other prisoners—to make an unplanned stop at Precinct 13 for the night, and it also strands the lovely Dr.Sabian (Maria Bello), who happens to be Roenick's psychiatrist. This setup doesn't take long, and it is then that the station house is attacked by a well-armed band of rogue cops, led by Marcus Duvall (Gabriel Byrne), who for their own reasons, have no intention of letting anyone inside survive. Hawke's troubled Roenick—who in the film's opening sequence looses two of his team on a botched undercover operation—is forced to go against the grain and offer what little weapons they have to the prisoners (including John Leguizamo and Ja Rule) to help defend the fort. That means lots of shooting and yelling, and quite a bit of taut action sequences, too. And that's where director Richet tosses out the biggest leap of faith, that the snowstorm (which if you're from the Midwest doesn't look all that bad, regardless of the editing) has shut them off from the outside world, and that the constant barrage of gunfire and explosions would not attract the attention of someone, despite the fact that we're told the precinct is in the industrial district. I've accepted countless other similar "leaps" before, so this one wasn't really any different, and it is essential to enjoying Richet's film that too many logical questions do not cross your mind. A good action film, no matter how threadbare the plot, can make it up on the back end if the presentation can distract enough to make viewers forget the fuzzy parts; Richet does that here, and the action sequences are fast and loud, cut with an urgency that makes the scenes genuinely tense, and he's quick to dispense with secondary characters (one was particularly startling) so that there is the sense that the bad guys just might win. Image Transfer Review: This may not have the cachet of more prominent mainstream features, but Universal's treatment of Richet's shoot-out action flick makes it seem so. The 2.35:1 anamorphic widescreen transfer—one that spends nearly its entire run in shadows or darkness—holds up exceptionally well. Detail and image clarity is excellent, and color rendering is free of smearing despite the fact that it seems intentionally overprocessed. Some minor edge enhancement slightly mars what otherwise could have been an exceptional transfer. Audio Transfer Review: No complaints whatsoever from either the 5.1 Dolby Digital Surround or DTS tracks found on this release, as both offer big, aggressive mixes. Rear channels get used often, with pronounced directional movement adding a layer of tension to the film's many action sequences, accented by frequent deep bass passages. Dialogue is very clean, balanced by the richness of the Graeme Revell (Daredevil, Sin City, Lara Croft: Tomb Raider) score. A French language 5.1 track is also included. Extras Review: Extras kick off with a commentary track from director Jean-Fran�ois Richet, writer James DeMonaco and producer Jeffrey Silver discussing the usual pastiche of subjects (locations, scenes that were reworked, cinematography, storyboards), and the general approach taken to modify the plot elements of Carpenter's original film to make it seem viable today. Next up is a set of bite-size behind-the-scene pieces, each focusing on a particular area. Armed and Dangerous (04m:55s) has weapons specialist Charles Taylor going over the look and feel of his "mobile armory", Behind Precinct Walls (07m:29s) has production designer Paul Austerberry talking about set building and computer animation, Plan of Attack (04m:27s) features stunt coordinator Steve Lucescu working to "make a vision a reality", and The Assault Team (05m:17s) showcases the heavy hitters: producer Jeffrey Silver, director Jean-Fran�ois Richet and writer James DeMonaco, who acknowledges the film is essentially a remake of Rio Bravo. A final featurette is Caught In The Crosshairs (12m:34s), and is your basic EPK, with talking head comments from most of the leads. There are also 6 Deleted Scenes (06m:11s) presented in workprint format, available with optional Richet commentary. None of the scenes are particularly remarkable, and most were trimmed for the usual timing reasons. My expectations for this were very low, which makes liking this film even more of an unexpected and pleasant surprise. Tense, violent and non-stop, Richet makes a fairly silly premise almost believable, and definitely entertaining.